You must be 20 years or older to enter and a vaild photo ID containing your birthdate is required at the door. Copies are not acceptable. We reserve the right to refuse admission to anyone. Yasutaka Nakata’s resident party FLASH!!! 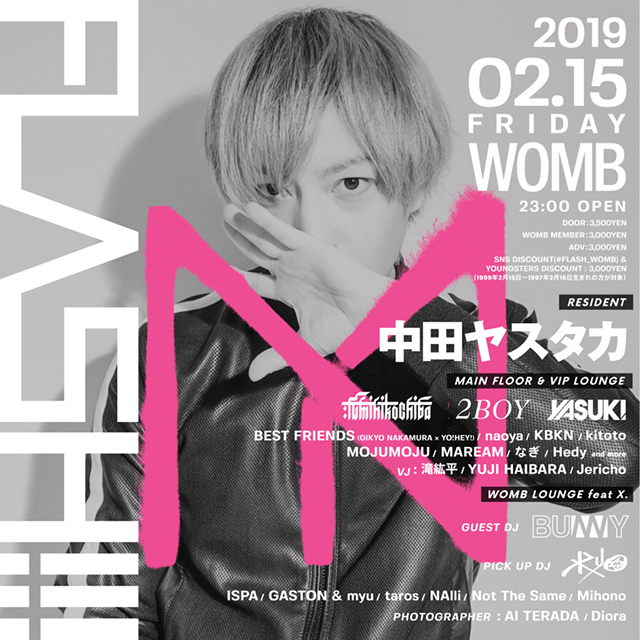 is now set to be regular event at WOMB!FLASH!!! is well known as the one and only long-running weekend regular party where you can hear musician and producer Yasutaka Nakata play.The party will bring together a lineup of artists that form the next generation of the electronic music scene, together with the helmsman himself, Yasutaka Nakata.FLASH !!! It would be no exaggeration to describe this as a party representative of Tokyo. Not something to be missed as it continues to lead us into the future.